And next? Over three years the HEAD Project (Holistic Evidence and Design) looked at 153 classrooms in 27 diverse schools in three local authorities in England – Blackpool, London Borough of Ealing and Hampshire. The team looked at sensory factors and multilevel statistical modelling to isolate the effects of classroom design. Whole school factors, such as size, navigation, specialist facilities and play facilities did notappear to be as significant as the design of the individual learning space. The findings that led to 16% improvement in students learning progress was attributed to a range of factors across these characteristics. Naturalness accounted for almost 50%, with around 25% each for stimulation and individualisation. Other considerations, size of the school, provision of shared specialist rooms and scale and quality of external spaces had less impact. 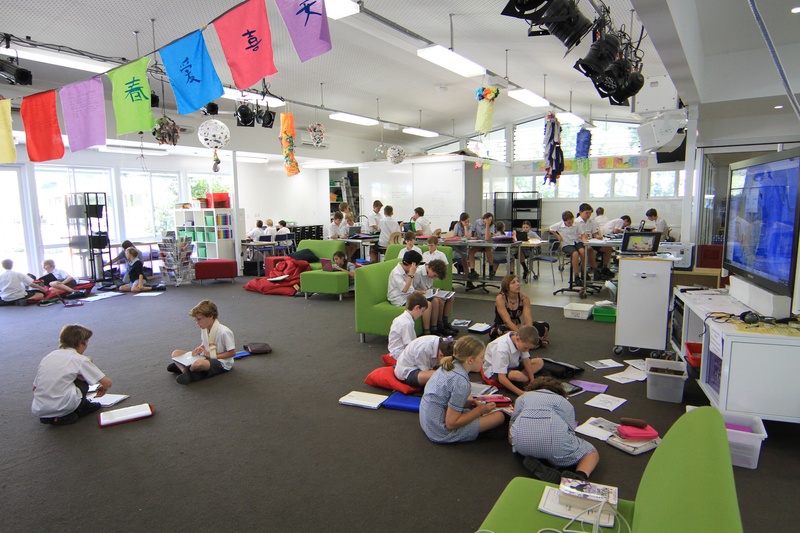 The most important factor was that the actual learning space, where the students spend most of their day. This needs to be well-designed. A few other factors mentioned in the report: The physical design at the school level was less important. Also, it is easy to over-stimulate with vibrant colours and overly busy displays, however a white box is not the answer, either. In the learning spaces small and cost effective changes can make a real difference, including changing the layout, choice of wall displays and colours of the wall. It is interesting to note that ‘sound’ was identified as a secondary factor, when it is often raised as a key issue by many. The addition of acoustic treatment, soft furnishings and carpets and rubber feet in furniture was noted in the report. While this research was focused on primary classrooms, it would be interesting to see how it made a difference to the learning spaces in secondary/high schools. Fascinating! I would love to work on a project like this! Interesting study and I would add some food for thought about the sound environment which must also be prioritised along, with lighting, ventilation and thermal comfort for indoor learning environments. Good speech communication is vital and increasingly dynamic; no longer the teacher just lecturing (only one person speaking), there is a different acoustic dynamic now with increasing collaboration including whole class interaction and group work etc. in the traditional classroom and increasingly many other additional spaces are now being used for discussions and engagement in learning. These activities can create an increased burden on the teachers as they must collaborate more and manage / coach the learning in a different way. The quieter and calmer a learning space, the easier it is for teachers to remain proactive in their approach thus empowering more student engagement, positive behaviour and increased possibilities and experimentation for learning. So, the food for thought is to consider the need to prioritise good acoustics for speech communication as the need has never been greater. Thanks Anne for this great summary of the research at Salford. Had the privilege of being on the Sounding panel for it. I think that the holistic nature is important as it underlies the complexity of the subject – could be dangerous if others start to quote indiscriminately percentages out of context. Given your experience in secondary ed, how do you see the translation of these factors to secondary / high schools?